This week has been blah, I don't want to do laundry (I still need to unpack from San Francisco) and today Adie told me she didn't love me (she was totally serious) but she loves Dinosaur Happy (her baby) ... I of course cried (for the second time today). Then Aden wouldn't go to sleep, so he played + pooped and now both my babies are asleep and I miss them like crazy How is that even possible?! ... They make you freaking crazy at times and then when they are sleeping you just want to go snuggle and be next to them. Everyone I know right now is either pregnant or just had a baby! I love to buy unique charming gifts from the softest blanket, to the pineapple table set, or my favorite wooden alphabet blocks! 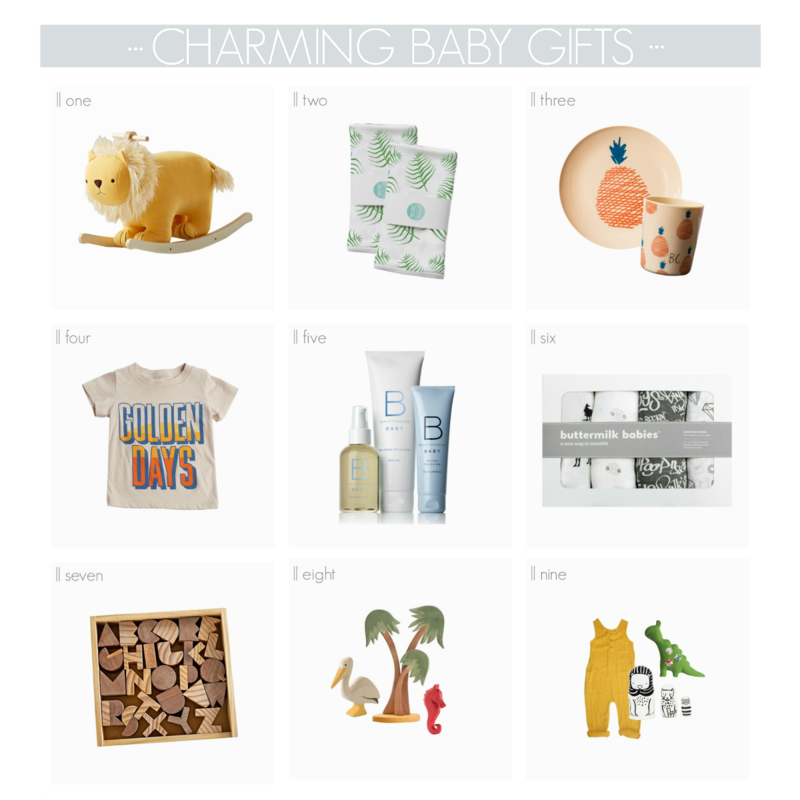 These gifts are just as charmingly unique for a first birthday! Aden's birthday is next weekend, and I have been working on some birthday party stuff and going through pictures is the worst thing I did today. I don't know why his birthday is harder for me than Adie's was, maybe because he could be my last baby and he's such a Mama's boy right now! But I am really so excited for next weekend, plus we get to see our family and I cannot wait! one. Lion Rocker - This tame feline prefers the playroom over the wild with its soft mane and plush body! I sent this to family (grandparents) when they asked what they could get Aden for his birthday and I secretly hope they do ;) it's so stinking cute and would look great in any nursery! two. Natti Natti Organic Blanket - The palms snuggle blanket inspired by nature and perfect for baby to snuggle up with. With super soft organic cotton, hand screened print, these can be used anytime or anywhere. three. Bobo Choses Mason Melamine Plate + Cup - I love unique kitchen stuff for babies/kids! The pineapple plate + cup are my favorite and perfect for any summer baby! Aden is completely off baby food right now (except yogurt) and if her didn't throw everything off of his highchair these would be the best. four. Baby Golden Days Tee - Everyone knows we love Peek! But seriously every baby needs a super soft tee to wear and be snuggled in and with their darling gift wrapping you will be set for those new little babies joining your lives. five. Baby Bundle Collection - A trio of head-to-toe essentials for your baby. The perfect collection for babies' sensitive, delicate skin. six. Signature Series-Clean - Some of my favorite swaddles, the collection is stylish, witty and unabashedly fun! Every little baby needs to be swaddle in these cotton and bamboo rayon swaddles. seven. Alphabet Blocks - With each piece made of rich mahogany and pine, this alphabet block set will outlast the baby stage so they can create words and even stack them high. We love them in our house! nine. Mango Reed Textured Romper | Cats Nesting Dolls | Maileg Dragon Rattle - Anything from this shop is so darling! I love unique outfits and toys! That little dragon rattle, so cute! Cheers to a better tomorrow! -XO!